The Birthstone Surround ring varys in width. 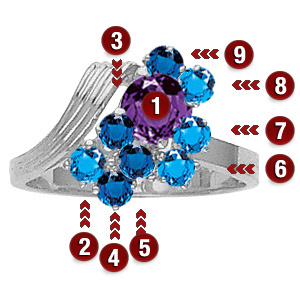 A ring with 4 stones measures about 8.5 mm at the widest top center measurement. This ring accepts 2-9 stones. The large stone is 5.0mm round and the smaller stones 2.5mm round. This ring is very unique and beautiful. It was ordered for a gift and the size 7 was a perfect fit. I would definitely recommend buying this ring to others--a quality ring for the price!